Address: 181/2 Fatehabad Road, Agra-282001, Uttar Pradesh. Access: 6 kms. From Airport, 4 kms. From Railway Station, 2 kms. From central Bus Stand. 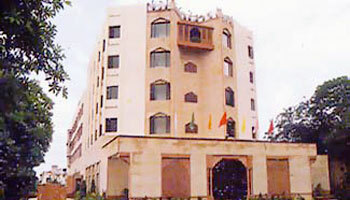 Facilities: Banquet Halls-2, Restaurants-2, Bar-1, Cuisine-Indian, Mughlai, Chinese & Continental, H/C running water, Telephone, T.V., Channel Music, Tea/Coffee maker; Business Cenre, Banquet & Conference, Beauty Parlour, Shopping Arcade, Health Club & Swimming Pool; Doctor on call, Laundry, Money Changer, Fax, Banking, Safe Deposit, Baby sitting, Valet, Travel Desk. MANSINGH PALACE at Agra makes you relive the centuries old romance. 100 elegantly furnished rooms and a captivating view of the "Taj Mahal" from the "TAJ VIEW ROOMS" transforms you into a "Shehenshah". "SHEESH MAHAL" - The multicuisine restaurant tempts the most discerning gourmet. "TEQUILA" - the well stocked hotel bar is just for "His Highness". Comfort at its best. Now you have got all the more reason to stay on and you will find the differnce yourself. The conference and banquet halls with modern facilities have a capacity of 35 to 300 person. The swimming pool with water-slide and the health club provides you with complete enjoyment and relaxation. The Royal Feeling you'll cherish for a long time to come. What do you think about Mansingh Palace Agra? Wajlee Ann Arbor, MI June 30 2008: "Comfortable and Spacious Rooms"
The Mansingh Palace is a modern hotel situated close to the Taj Mahal. The room was larger than any other we stayed in while in India (we tried to stick to hotels in this price range), so it was a pleasant surprise after being cramped into tiny rooms. The breakfast buffet was tasty and had a variety of hot and cold foods. However, it is not open early enough if you want to arrive at the Taj Mahal at the crack of dawn to see the sunrise and avoid the crowds. We ended up eating when we got back to the hotel. Practicalities: Close to the action. Responsive staff with good English. Clean and comfortable rooms. Maydane Copenhagen June 5 2008: "It is not impressive but not bad at all"
We decided to sleep one night in Agra and our Delhi hotel suggested a travel agent called 'Perfect Holiday Tours'. We had our own driver and was given a room at Mansingh Palace. The hotel is full of non-indian tourists. They have facilities like sauna, jacuzzi, gym, pool, restaurant etc. But the gym, sauna and jacuzzi look like haven't been used for long time. most guests only lounged and utilized the pool. Our indian friend told us that Agra is not a safe town for caucasian tourists at night. Well we didn't see any caucasian tourists walking around the town during day time either. They must be at the attractions or their hotel's pool cause Agra is so dirty that it is beyond your imagination! There's not much to do in the town. But I have to say that seeing Taj Mahal pays off everything. One just have to see it at least once in lifetime. The service at reception is fast and professional enough to answer all questions. I even tried their 'swasti spa' - the synchronize ayurvedic massage. Not my thing. They use 100 ml of oil and it is way too oily for me. and the massage room doesn't look hygienic. neither the towels or combs. But it's only 2000 rupees for 55 minutes.. Kinda cheap for a European but definitely not-recommended..
Breakfast is fairly good and has wide selection. The room is spacious but very outdated. The bathroom is also big and has a bath tub as well. In sum, the hotel is not really impressive, we had better. But it is not that bad. Would i recommend this hotel? Yes if you're traveling budget.. then this hotel is the best for you. If you have the money, avoid this hotel and get something better in Agra. Alh UK April 6 2008: "Good Location"
We stayed here for 2 nights as part of the Kuoni "Taj Tour". This was a very nice hotel, clean and comfortable. There was a pleasant pool outside which was refreshing after a day sight-seeing. The hotel was well situated for shops and restaurants with Costa Coffee and Pizza Hut being next door. It was also close to the Taj Mahal. Our rooms at the back were quite until about 5 am when the call to prayer woke us up, still we were used to our early morning calls for sight-seeing so it didn't bother us too much. Breakfast buffet was fine, we didn't eat at the hotel restaurant in the evening as there were local restaurants to try. We stayed here for 2 nights as part of the Kuoni "Taj Tour". This was a very nice hotel with beautifully furnished, spacious rooms - we could even glimpse one of the towers of the Taj Mahal from ours. There was a pleasant pool which our children used and a small fitness room. The hotel was well situated for shops and restaurants (Pizza Hut and Costa Coffee very close) and we took an Auto Rickshaw (with A. M. Begg - asked a fair price) from outside the hotel to see the "Baby Taj" and the Taj Mahal at sunset (agree a price before you go). Our rooms at the front were slightly noisy, but this didn't detract from a very enjoyable stay. Hobbo UK April 2 2008: "A Great Hotel"
A great hotel and fantastic value. It suprised us both on arrival that is was only given a 3star in most ratings. The rooms are excellent and it has all the services expected of a quality hotel. Easy access to Taj Mahal and Agra Fort (5-10mins via tuc-tuc). Also has plenty of amenities around - internet cafes, shops, chemists, pizza hut! For the money you would struggle to beat this hotel and if you like you can pay extra for a Taj View although in my view the distance from the Taj makes the upgrade a little over priced. Seattle, Washington March 2008: "It's No Palace"
Mansingh Palace is located next to Pizza Hut in an area full of restaurants and hotels. We arrived in the evening and had the hotel picked us up. Our driver had an attitude; he didn’t help us with our small luggage – not that we need his help. We requested and agreed to pay for an AC car but we got non-AC at the AC price. The driver and we ended up arguing even before check in. The front desk offered no apology or help. Overall, the staff had an indifferent attitude. At US$66 per night w/ breakfast in Nov., the room rate was reasonable. However, make sure to check out the room first. Those near the street could be quite noisy. Some were renovated recently, but we couldn’t stand the leather smell from the furniture. We settled for an older but quiet one at the back. Breakfast was buffet style with quite a bit of selections. Next morning when we saw the same car and driver showed up to take us sightseeing, we called it quit. We could figure out our way around ourselves. Shelley UK Feb 14 2008: "OK Hotel"
Recently stayed here for 2 nights only. Our room was small but nicely furnished and very clean. The hotel is situated near to restaurants and shops. Not a good place to eat. The dining room was very small and crowded with tour groups, we had to share a table with a party who did not speak any English. Advise eat elsewhere. Breakfast was also a bit of a nightmare. Saladana Washington DC March 2 2008: "Not bad but not memorable"
The room service food was very quick and good, much better service than in the restaurant. I recommend avoiding the Western-style food and sticking to Indian cuisine. It was quite tasty. The dry cleaning service was fast, excellent and inexpensive. The rooms were functional and clean but not particularly attractive. The shops and internet kiosk were quite welcome. During the course of my tour, I had little opportunity for shopping and this filled the gap. The only negatives were twofold. First, the hotel did not want to accept my American Express card. This happened to another guest that I met as well. You have to press the issue and stand fast for them to accept it. Secondly, I got locked out of my room at one point due to an odd lock and a master key was required. We didn't know what to expect but I must say we were very pleased with the overall hotel. The room was just great, fantastic airconditioning and a very modern bathroom that functioned perfectly. Hotel check-in and check-out was also very efficient. Breakfast was a bit pushed as this hotel obviously caters to groups, but there was a large selection of Indian and continental choices. Our only problem was getting transport from the hotel to a restaurant 3km away. The hotel 'travel service' wanted to charge us Rs500 for the return trip. We eventually (after wasting a lot of time) negotiated with the hotel branded rickshaw driver who did it for Rs250. However, on the return trip there was a lot of problems with this particular rickshaw driver who wanted to take us shopping to 3 shops at 9.30pm when all we wanted to do was go to sleep as we had a 5.30am start to visit the Taj. But we would certainly recommend the hotel, just make sure you have some way to get around if you don't want to eat dinner there. Suzy, UK Nov 24, 2007 : "Western standards"
I have now been twice to this particular hotel and have found it consistantly good. The standard is similar to what you would expect in a holiday inn. Clean, comfortable rooms, with a high level of customer service. In comparison to other hotels we stayed in the cost of room service etc was a little pricy, but then this hotel was a bit smarter. The restaurant is pretty busy. It seems to attract tour groups. If like us, we were 2 friends, you are in a small group, there are hardly any small tables in the restaurant and you end up sharing with others. There's an extensive menu, Indian buffet food along with other types of food i.e Chinese or European. The food was good. Next door is a Costa cofee and a Pizza Hut. Not very Indian but a refreshing change. Access to the Taj is only 10 mins away. Next door is a shop that sells all the usual nik naks. It had very cheap internet access at only 10 rupees for about half an hour. San Diego, California Nov 7, 2007 : "decent mid-price range hotel"
Setting out on a ten day trip though Rajasthan, the 100 room, four story Mansingh Palace was our first stop for a one night stay. Located on a quiet street, the hotel's lobby, rooms,and ground floor hallways were adorned through extensive use of colored marble and terrazzo. Check-in was swiftly and efficiently handled, however our assigned room room 301 was not inhabitable, evidently a water leak one floor higher caused water to drip out from the ceiling and the A/C unit, the toilet did not flush, and the room safe was locked and would not open. Without much ado, we were assigned another room, which aside from a few insects seeking to hide when we turned the bathroom light on, turned out to make for a comfortable stay. The amply sized room came with two single beds with a comfortable mattress, decent pillows, and was very quiet, making for a good night sleep. It had a couch, couch table, area rug, writing desk, flat screen TV, fridge, Coffee/tea maker with supplies, A/C, and everything in the room and in the bathroom worked, except the room safe. It was locked and required a technician to open it, and on wanting to retrieve our belongings in the morning, it would not open again. It took about 30 minutes for someone with the master code to open it for us. The bathroom with tub shower offered the usual assortment of toiletries, good towels, hair dryer and was very clean, as was the room. Dinner of Indian dishes in the nice restaurant was excellent and reasonably priced, and served by attentive staff. For those not familiar with the Indian menu items, consider SHORBA GHAFFARI, a delicate extract of chicken soup, spiced with herbs and saffron, kADHAI MADCHI, fish cooked with capsicum, onion and a tomato gravy, NAAN, a Tandoor flower bread, and a Kingfisher Pils to rehydrate. Two musicians offered Indian pop. Breakfast, served buffet style in the ground floor cafeteria offered something for every taste. Additionally an omelet cook stood by. A bar/lounge, business center, gift shop, and a beauty parlor rounded out this full service hotel. All in all and despite some irritation with the safe, the Mansing Palace made for a good one night stop.